Allahu-Akbar. Allah is the greatest. These are the first words a Muslim child hears after entering this world. The father makes the call to prayer in his or her ears as the welcome-to-this-world message. The same call is heard wherever there are Muslims, five times a day. The prayers also begin with this pronouncement. Certainly this is the emblem of the Islamic faith. There is no power in the world equal to the power of the One God. Allah is the greatest. This has been the Islamic message right from the beginning. 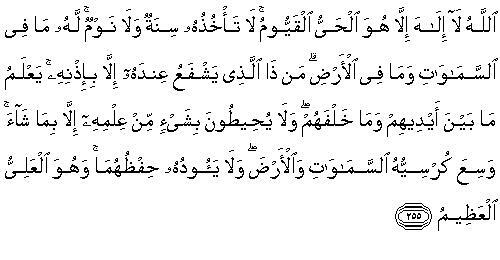 The very first surah or chapter to be revealed to the Prophet Muhammad, Sall-Allahu alayhi wa sallam, was surah Mudathir. And it contains the command: "And Thy Lord, do thou magnify." The Arabic word is kabbir. Declare Allahu-Akbar. Announce that Allah is the greatest. The pagans of Arabia did not like it. The Jews and Christians were not happy with it either. The irony is that at the same time all of them professed belief in the statement. The pagans believed in many gods, but did believe in the Supreme God too. They claimed authority for their smaller gods, but did not claim them to be bigger than Allah. Jews and Christians clearly believed in God, the Creator and Lord of the universe. With the exception of a small group of atheists, that remains valid till today, as the U.S. dollar bill announces to the whole world: "In God we trust." The question is, then, why should anyone have problem with Allahu-Akbar. Why feel uneasy with it or feel threatened by it? Is it not saying the same thing that they already agree with? The answer lies in the Islamic concept of God. In the western literature, God is presented as a wise man. (To the feminists He is increasingly a She). To the mathematician-philosopher, He may be a super mathematician or even a differential-equation. To the scientist, He is the First cause, that jump started the automobile of this universe that is now running on its own. To all of them, He is a good subject for a hobby but is irrelevant to our day to day affairs. As one scientist puts it: "I subscribe to Einstein's religion. It's an oceanic feeling; there's that great big thing out there that's pretty marvelous." Thing? Einstein, who reportedly considered himself spiritual but not religious, said: "I want to know how God created this world." The implication is that He did it once. I am studying and conquering His universe now. But for intellectual curiosity it will be good to learn a little more about Him. "He may have created the laws of nature but since creation He has left them pretty much alone. He does not come in and tweak them any more." What a tremendously empowering creed! From the smallest to the largest, everything in the universe depends on Him. He depends on none. All other powers are illusory. His is the only real Power. When He is on our side, we need not fear anyone. If He is not pleased with us, the support of the whole world for us will be for naught. Worldly powers try to manipulate people by telling them what they can do for them and what they can do to them. But a person informed by Allahu-Akbar will not be tempted by the first or intimidated by the second. The power of "world powers" evaporates before the shouts of Allahu-Akbar. In fact there is no empowerment outside this belief, and no enslavement to other humans with it! We can see why the claimants to power in this world may be threatened by it. What a tremendously liberating creed! It liberates us from slavery to our own desires also. His knowledge is unlimited. Ours is extremely limited. What can we do except follow His commands? He is watching us all the time. We cannot get away with disobedience because of His oversight. He will judge us and no one will be able to intercede on our behalf except with His permission. We can see why those who are afraid of accountability may be threatened by it. "Those who dispute about the Signs of Allah without any authority bestowed on them, there is nothing in their breasts except the quest of greatness, which they will never attain..." [Mumin, 40:56]. We can see why those with arrogance may be threatened by it. This includes the arrogance of science. We see it in the scientist who declares that there is no need to invoke a spiritual hand of God since everything has a rational basis. Or the medical doctor who thinks that he can control the biological processes. (Look at all the pronouncements of the genetic engineering pundits, euthanasia advocates, and population control gurus). On the other hand, a scientist free of such sickness looks at the workings of this universe; the great design in it; the tremendous purpose in every creation; and he finds himself compelled to say: Subhan-Allah. Allahu-Akbar. Glory be to Allah. Allah is the greatest. Similarly a medical doctor constantly finds the Hand of God in the life and death struggles of his patients; some succumb to minor problems, others survive major ones. Allahu-Akbar! Allahu-Akbar is the weapon that gives us the courage to challenge all subjugation, political or intellectual. It makes us turn our attention to the Creator and ignore other creations like ourselves. In the jihads in Afghanistan, Kashmir, or Bosnia, as elsewhere, the power of this weapon has been felt by people on both sides of the conflict. In every conflict the shouts of Allahu-Akbar instilled fear in the hearts of the oppressors. It boasted the morale of the mujahideen with new levels of hope and courage. And that is the way it should be. Because Allah is the Greatest.